also commanded an elite guard of warriors. Powers/Abilities/Functions: The Mystic Mountain is composed of purest crystal. It normally exists within a stalactite within the crater of the Jinni Slave of Mogul, in the Forbidden Land, on the border of the lands of Gunderheim, Hindi, and Skornheim, on the periphery of the landmass of Asgard. The entire mountain can be free and transported through the air by Mogul. History: The origins of the Mystic Mountain are unknown. (Thor I#137/2 (fb) - BTS) - Long ago, Mogul conquered the home of Hogun the Grim, slaughtering the people, enslaving a few, and steal their battle standard. The slaves and the standard were taken to the Mystic Mountain. Hogun and his father and brothers escaped the initial slaughter, and subsequently dedicated their lives to relocating the Mystic Mountain to recover the battle standard of his people, but to no avail. Hogun's father and all of his brothers perished seeking the Mountain. (Thor I#137/2 (fb) - BTS) - Saguta fled the Mystic Mountain. (Thor I#137/2) - After Mogul taunted Thor and the Warriors Three (Fandral, Hogun, and Vosltagg), he had his giant Jinni pick him up and carry him off, returning to the Mystic Mountain. (Thor I#138/2 - BTS) - Wazir granted knowledge on the location of the Mystic Mountain to Thor and the Warriors Three. (Thor I#139/2) - As the quartet of gods approached the Mystic Mountain, Mogul sent the Jinni Devil to destroy them. (Thor I#140/2) - From the Mystic Mountain, Mogul observed as teh Jinni fell before the quartet of gods. (Thor I#141/2) - As the quartet stormed Zanadu, Mogul unleashed his elite squad of guardsmen, then sent Alibar and the Demon-Riders against them. 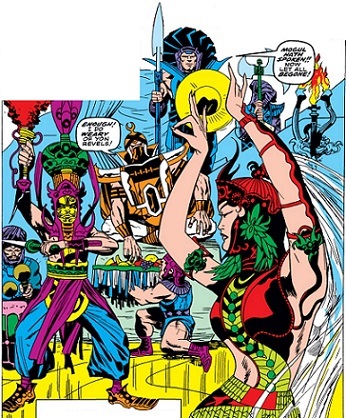 (Thor I#142/2) - From the Mystic Mountain, Mogul assaulted the remaining countrymen of Hogun, still his prisoners. He then took to his Flying Carpet, left the castle, and prepared to unleash the Spotted Plague on all those who defied him. (Thor I#143/2) - Within the castle, Shezazada activated a trap door, sending Volstagg hurtling to confront the powerful Mutaurus. However, Volstagg pulled her with him, and Shezasa was forced to give him the Enchanted Rod of Wondrous Wizard Power to defeat Mutaurus to save them both. (Thor I#144/2) - Fandral, Hogun, Thor, Volstagg, and Alibar routed the Demon-Riders, while Mogul plotted slaying all who lived with the Spotted Plague. (Thor I#145/2) - As Mogul prepared to dump the plague over Zanadu, the heroes made their way to his throne room. Alibar and Hogun used the Enchanted Crystal to defeat Mogul. (Thor I#474 (fb) - BTS) - Alibar became the ruler of the Mystic Mountain, watching over the Enchanted Rod that contained Mogul. (Thor I#474 (fb)) - Shezada seduced Alibar and then freed Mogul from the Enchanted Rod. Mogul summoned his servants, retook control of Zanadu, and threw Alibar into the dungeon. (Thor I#474 (fb)) - Hermod and Hogun arrived in Zanady to try to rescue Alibar, but were defeated and imprisoned as well. Hermod eventually escaped and headed back to Asgard by himself. (Thor I#474 (fb)) - Mogul transported the Mystic Mountain to just outside the city of Asgard, and led his servants to attack. With the Asgardians' help. Alibar trapped Mogul in the purloined Lamp of Alaeddin. Comments: Created by Stan "The Man" Lee, Jack "King" Kirby, and Vince Colletta. Some sources describe the Mystic Mountain as if it were within the land of Zanadu, rather than being Zanadu itself, as initially described. Other sources describe Zanadu as a castle within the Mountain/city. and goes on to describe that eerie and beautiful palace with innuendos of sensuality and madness. This poem's tradition also associates the name "Xanadu" with memory and lost work, because Coleridge said he lost part of the poem due to a mundane interruption. We chose the name "Xanadu", with all these connotations, to represent a magic place of literary memory and freedom, where nothing would be forgotten. The "freedom" part applies even today: the ruins of of Kublai Khan's actual palace at Xanadu have been placed off limits to Mongolians by the Chinese government, because of its symbolism of Mongolian independence. And then there's that 1980's Olivia Newton-John movie...though I never saw it. 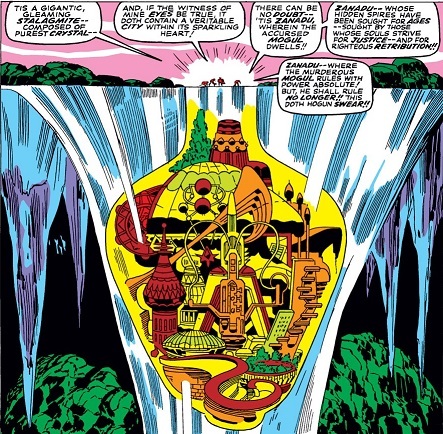 The Mystic Mountain supposedly perished during the Ragnarok in Thor II#85.